Enter your keyword or search term. International Marching Bands Announced for Rome Parade 2019! We are delighted to announce Amaseno Marching Band & Thousand Oaks Marching Band for Rome Parade 2019! The Gadsen Elementary School District 32 Marching Band is from San Luis, Arizona, which is located in the Southwest corner of the State on the boarder of San Luis, Rio Colorado, Mexico. Approximately ninety nine percent of the student population is of Hispanic ethnicity. 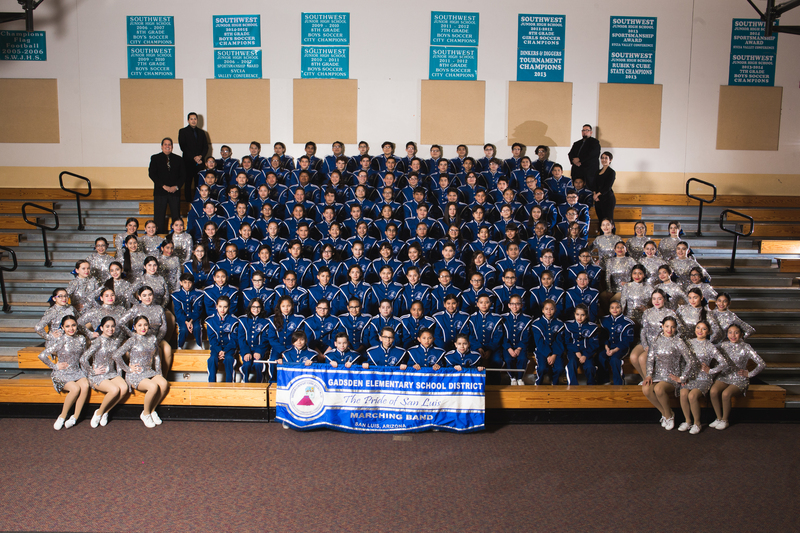 This Marching Band has been highly recognised as both state and local levels; along with being awarded numerous first place trophies. They are the pride and joy of San Luis, Arizona. The Gadsen Elementary School District 32 Marching Band has participated in the Twenty-Seventh Annual New Year’s Day Parade and Festival in London, England on January 1, 2013. Since 2005 the band started to move in to the world of Marching Bands. The musical repertoire of the Band has always has striven to be different from that of traditional bands and continues to be inspired by American High Schools Marching Bands in their choice of musical instruments and uniform design. They are equally proficient in performing in Parades and Standing Concerts, thanks to the special training undertaken by the musicians which has given them the skills to perform songs from every musical genre playing refined arrangements and producing an impressive sound. Their development as a marching band has been made possible by the advice and training of experts and professionals from the Marching Band world both in Italy and abroad. Particular thanks are due to the talents of the woodwind, brass, percussion and Colour Guard sections who constantly seek to achieve excellence in sound and movement thus giving the group a special energy and a powerful performance. Since 1986, the group has toured internationally and have participated in virtually all of the most important events in Europe. In 2009 in Kerkrade, The Netherlands, the “Amaseno Marching Band” participated for the first time at the World Championship Marching Show Bands where they reached the final stage of the competition. Participants for the Rome New Year Parade & Festival will be announced throughout the next few months. Stay up-to-date will all the latest news via our Twitter, Facebook & Instagram channels. The Lincoln Youth Symphony are set to perform in the Eternal city next month. The group from Lincoln, Nebraska will be arriving in Rome on Friday 8th March and are set to tour iconic locations and perform at venues around the city. The historic heart of Rome will be filled with music, culture and colour on January 1st when the city’s turn of year tradition, the ROME PARADE returns. Giant Hellium Balloons Announced for Rome Parade 2019! For the first time in the Parade's history, we will be introducing custom made, giant helium balloons to the streets of Rome on January 1st.